Companies increasingly choose to qualify employees and partners online with their very own training courses. Cloud based Learning Management Systems (LMS) lean for efficient content creation and distribution. When looking for an easy-to-use and cost-efficient Software-as-a-Service solution, questions about data security arise. Where will the data be stored? Who accesses it? Can I count on the availability of data? 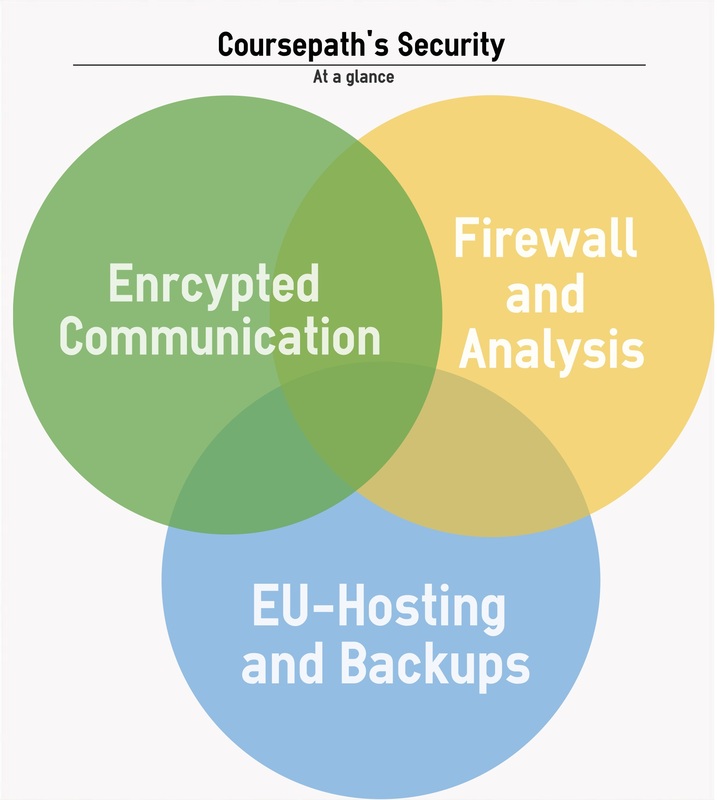 We at Coursepath have taken care of physical and digital measures to host your data securely and have them available for you and your participants at all times. Our customers’ data are hosted at servers in the European Union, in the Netherland. That means, they are subject to strict European data protection laws. Access via Patriot Act e.g. is prohibited. Our servers and your data are located at the certified datacenters of BIT in the Netherlands, administered through our ISO 27001 certified hosting partner Exonet. We care about a maximum level of security for our customers’ data. By exclusively using certified services we have found reliable mechanisms for ensuring information security. Smooth operation with an uptime of 99.9% is assured in our Service Level Agreement. All data is stored on servers in data centers in the Netherlands. The servers are protected against unauthorized access by physical controls and measures on the premises. Coursepath’s legal obligations (either through one of our companies Viadesk bv or Viadesk GmbH) are held transparent in every license agreement, your contract. If you have any inquiries about our obligations and services, please do not hesitate to contact us. Every communication between the servers and user is encrypted via HTTPS. On the way from the servers to the user data is fully encrypted. As data are decrypted only on a user’s device, man-in-the-middle attacks are reduced to a minimum. We use firewalls to protect our servers against direct attacks. All technical protective measures’ integrity and functionality are ensured by regular software analysis. Audits are conducted by an independent service provider. Customer data is backed up off-site on a daily basis. This reduces the risk of data loss to an absoulte minimum. Would you like to learn more about data protection and security in SaaS? Get in touch with Manuel Yasli: E-Mail: m.yasli@viadesk.de or +49 (0)221 828 293 64.